The Welsh Guards came into existence on February 26, 1915 by order of His Majesty King George V in order to include Wales in the national component to the Foot Guards. They were the last of the Guards to be created, with the Irish Guards coming into being in 1900. Just two days later, the 1st Battalion Welsh Guards mounted its first King’s Guard at Buckingham Palace on 1 March 1915 – St David’s Day. 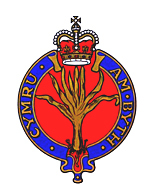 To Learn more visit this page on Wiki.com for an interesting overview of the Welsh Guards.